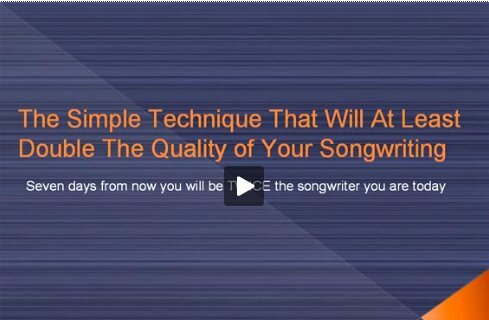 This song writing help article is part 2 of a 3 part series, where you'll discover a simple formula that will have you writing songs of stunning quality in a very short time. To go to part one of this song writing help article series, click here. After stopping your recorder, take a break for an hour. Go for a walk. Or have a conversation with a loved one. The point is, you must take your mind off what you just created. This will get you ready to listen back from the perspective of someone who is simply “listening to music”, not “creating it”. This is the part in the process where you can actually bring your analytical resources back to help out. After your break, your job is to now listen back to the 40 minute recording, and document on a piece of paper the ideas you feel are worth pursuing. So as you listen back, take out a note pad and when a good idea occurs, write down the time of the recording as well as a small note that describes the idea. After listening back to the recording you’ll have on your note pad a number of ideas you can use in your song. I bet you were surprised at the quality of some of your ideas, hey? Now, I want you to choose TWO related ideas. There may be many more, but we want to take two ideas and quickly put them in the form of a song. Now, keep in mind this is NOT going to be a full song structure. This is going to be a sort of “mini” song, with the purpose of installing rock solid confidence in you so you can go on to write many more excellent, full pieces. So what you’re going to do here is arrange these two related ideas into a mini song format. You can do this anyway you like, but the simplest way is to use one idea as a VERSE and one as a CHORUS. Then simply structure your song like this. But just do this for now, because in a few hours I want you to be listening back to a full song that you’ve created and are extremely happy with. Once you reach this point you’re quite welcome to expand the song. But for now, let's keep things ultra simple and organize these ideas into two verses and two choruses. Step 5 is pretty easy. What you need to do here is perform the instrumental that you’ve just compiled. To do this, just hit “record” and then play the whole song through on your instrument. No need for perfection here. Just do a maximum of 3 takes, and then pick the best one. It’s time to write some lyrics! The first thing you need to do is have something to write about. There are many ways to get great song ideas, but for the purposes of keeping things simple I want you to write down 5 of the most important moments in your life. Once you’ve got these 5 moments in front of you, look at them and ask yourself if there’s a good story or song "angle" in any of them. You’ll probably find there’s a “song worthy” story in at least three of these moments, so choose one of them and use it as your song topic. Just so you understand why we did that exercise… in general humans experience the same basic emotions, therefore by choosing a topic based on a really important moment in your life it’s very likely that it'll also be based on one of the main basic emotions that’ll affect the majority of listeners. Ok… here’s what to do next. Take out a piece of paper and also a stopwatch. Now, I want you to write freely about the topic you’ve just decided on for 20 minutes straight. While you’re writing, don’t try and be perfect. Don’t try to construct “the perfect line” or the “ultimate hook”. Doing so will once again invite your analytical resources into play which will block your creativity. Do everything and anything you can to keep your pen moving. Write rubbish. Write anything that comes to mind. Build a picture of the event your writing about in your mind, and feel the emotion from it. Express this emotion on paper. Tell the story. Do this for 20 minutes without stopping, no matter how bad you think it’s going. Once the 20 minutes is up stop your stopwatch, get up, and take another break for an hour. Step seven is to read through the brainstorming session you just had, and begin to sculpt it into a compelling song. As you read through, you can begin deleting the terrible lines (there will be a few, I promise!). If there is a line or group of words that has potential, keep it and see if you can make it better. A great way at look at lyrics is this: Fit big ideas into short, powerful sentences. Look at what you’ve written and find sentences that contain a big idea. Then take this sentence and try and “cut” “cut” “cut” until it’s one short, pithy sentence that delivers a profound, even epic idea. You’ll notice a few sentences that really JUMP off the page. These are your “hooks” or "focus points" of your song. Use these repeatedly through out your song, perhaps as a chorus. When you’ve narrowed your page down to a small number of power packed sentences, you can add even more punch to it by going through a thesaurus and replacing boring words with “action words”. As you do this, don’t look for long complicated words. This is a mistake that many songwriters make. Instead you need to look for “action words” that evoke images or situations in the listeners mind. But what you’ve just done is enough for the purposes of this song. Remember that you’re not trying to become a master in one day. You’re trying to get a “taste” for songwriting by writing one song really QUICKLY that you like very much. So don’t spend longer than an hour editing your lyrics. For a collection of songwriting tips and song writing help articles, click here.